The Lumia 720 may be sitting in the middle of the Nokia WP8 lineup, but it has features that elevate it above the average midrange experience. Starting with the sensitive touchscreen that works with gloves (like the flagship 920), the screen also boasts ClearBlack tech and a curved Gorilla Glass 2. The Nokia Lumia 720 also has the widest aperture on a phone yet, F/1.9. It's also the only Lumia thinner than 9.9mm, its battery is bigger than that of the 820 and it has expandable storage too. The Lumia 720 may as well have struck the perfect balance - affordable price for features that will make mid-range Android phones green with envy. It does miss out on a few things, though. Its chipset is fairly capable, but 512MB of RAM can result in the occasional app incompatibility. You don't get 1080p video capture or LTE like on the Lumia 820, either. One of the bigger disappointments was that it comes with free voice-guided navigation for only a single country. We've gotten so used to Nokias providing worldwide offline navigation, that this one took us by surprise. Still, it only matters if you'll travel abroad, for home country navigation it's still one of the best solutions around. 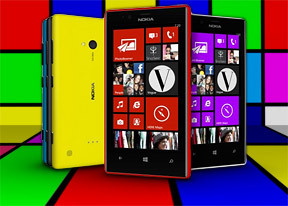 The Nokia Lumia 720 has to compete with the Lumia 820 for your attention. Both have very similar specs and each has certain advantages. In the case of the 820, those include the AMOLED screen with almost infinite blacks, the higher res stills and video camera, and the LTE connectivity. However, it has a smaller battery and is thicker and heavier, too. But the difference in price is not all that great. The Nokia Lumia 620 is also an interesting alternative - it's cheaper, lower-end device, but uses the same chipset and a sharper 3.8" WVGA screen (246ppi) with ClearBlack technology. The still camera is only 5MP but shoots 720p video too. And there's 8GB of built-in storage plus a microSD card slot. The HTC Windows Phone 8S has a sharper but smaller screen compared to the Lumia 720, WVGA resolution spread on a 4-inch screen boils down to 233ppi. It has the same chipset and a 5MP / 720p camera, plus expandable storage. Its maker-exclusive perk is Beats Audio. Then there are the Androids. A Samsung Galaxy S II Plus is a rehash of the classic S II with an S III styling. It has a 4.3" Super AMOLED screen (full RGB matrix), an 8MP / 1080p camera and it is slightly slimmer and lighter than the Lumia 720. The Sony Xperia T is a former flagship with a bigger, sharper screen - 4.55", 720p, 323ppi - and a 13MP / 1080p camera, plus 16GB of built-in storage plus a microSD card slot. The chipset is faster than the S II Plus and Lumia 720 chipsets too. The Nokia Lumia 720 may be some of the best work we've seen from the Finns recently - not a pricy best-of-the-best flagship, but an affordable, well-built phone that packs more than enough features to get users interested. It has its nagging flaws, but as an overall package it's hard to beat.